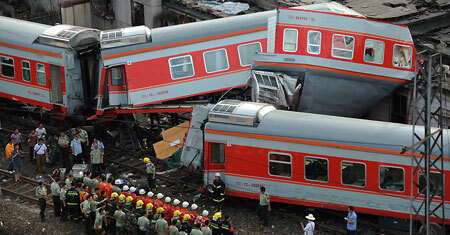 Two passenger trains collided in central China early Monday, leaving at least three people dead and 60 injured. The accident took place at 2:34 am at Chenzhou railway station in Hunan Province, said an official from Guangzhou Railway Group, which operates station and the trains involved in the crash. Train K9017 from the provincial capital Changsha to Shenzhen, Guangdong Province, and train K9063 from Tongren, Guizhou Province, to Shenzhen collided, driving several carriages off the tracks. The K9017 locomotive and the first five carriages as well as the K9036 locomotive and the first two carriages were derailed, the official said. The fourth carriage of the K9017 was the most seriously damaged, rescuers said. One of the trains crashed into two nearby houses, causing them to collapse. "A strong voice pulled me put of dream," said Wang Manju, whose house is next to the station. She was astonished when she opened the door, to see the alley filled with dust and an overturned carriage. "The train was twisted. Parts seemed to be torn down. I called the police after hearing screaming from the train," Wang said. Two bodies was found in the store in front of Wang's house. The two, buried in the debris, were a mother surnamed Li and her son. "It was terrible to look at," Wang cried. The electricity supply was also cut rescuers said, giving no information about when it would be resumed. Services in one direction of the line resumed at 10 a.m. and the other resumed at 2:30 p.m., said the official. Thousands of passengers had been stranded in Chenzhou Railway Station. More than 50 buses had been sent to transport them to their destinations. As of midday, almost 1,000 passengers had been transported by 26 buses to Guangdong Province, the official said. All the injured had been taken to nearby hospitals. Railways Minister Liu Zhijun has gone to Chenzhou, 300 kilometers from Changsha, capital of Hunan, to oversee the rescue work. The ministry and the provincial government are investigating the cause of the accident. Another fatal train collision happened on April 28 last year when two passenger trains collided, leaving 72 dead and 416 injured. The railway was interrupted for more than 21 hours. Investigation showed the accident was caused by speeding. In May, Minister Liu was given a demerit by the State Council as a discipline punishment.